Arthur A. Levine Books, 9780545852661, 256pp. On the first day of sixth grade, Kyle Constantini lands in the principal's office after standing up against (that is, punching) Ino Nevarez, who was teasing a deaf girl at school. Her punishment? Join the NAVS program, which teaches constructive problem-solving (that is, not punching). Kyle loves NAVS, where her team competes in a challenge to navigate a maze. But her parents refuse to let her participate... so Kyle may just have to fudge the truth a bit to get around them. Then her best friend starts to crush on a cute new English boy, who seems to be interested in -- Kyle? As the NAVS competition approaches, she has to trust her instincts, take some good advice, and figure out her way through the amazing maze of middle school. 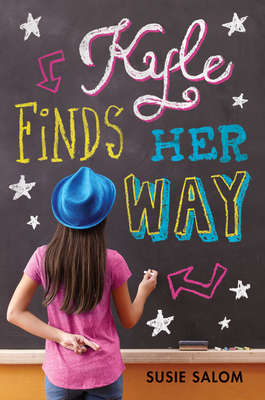 Rich characters, a big heart, and a witty, warm voice make Kyle Finds Her Way a debut worth discovering. Susie Salom loves sunny, chirpy days, strawberry tamales, and the color blue. She once purposely got on the wrong bus to keep talking to a new friend on her first day of sixth grade and has been following her adventuresome heart ever since. She lives in the west Texas town of El Paso with her husband and daughter and their obese cat. Please drop by and say hi! to her on Twitter at @susie_salom, and visit her website at www.susiesalom.com.